It's the perfect companion piece to the Money Savvy� line of four-chambered banks. 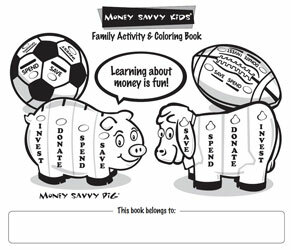 This 24-page book is the perfect accompaniment to the Money Savvy Pig, Cow and Football because it helps teach many of the same important concepts contained in our Money Savvy Kids Basic Personal Finance school curriculum. Kids can color the pages while they learn about important concepts such as bartering, interest on your savings, goal-setting, smart-spending, philanthropy, long-term investing and entrepreneurship. Other activities include establishing personal savings goals, creating a spending wish list, designing a worthwhile charity, and crafting a business idea.